Rapido started in 1961 when Constant Rousseau began manufacturing folding canvas caravans. His son Pierre joined him in 1976, and in 1983, their first motorhome rolled off the production line. Pierre took charge when Constant died in 1985. By the late 1980s, they were manufacturing a range of motorhomes. family-owned and operated business bringing family values to its dealings with both staff and customers. When it comes to interiors, most European manufacturers stick to tried-and-true layouts that have served them well in the past. However, with the 8094dF, Rapido has thrown the rulebook out the window. This layout doesn’t have a dedicated bedroom. It has been replaced with a second lounge, the first being where the lounge usually is, up front behind the cab. In between are the kitchen and bathroom. 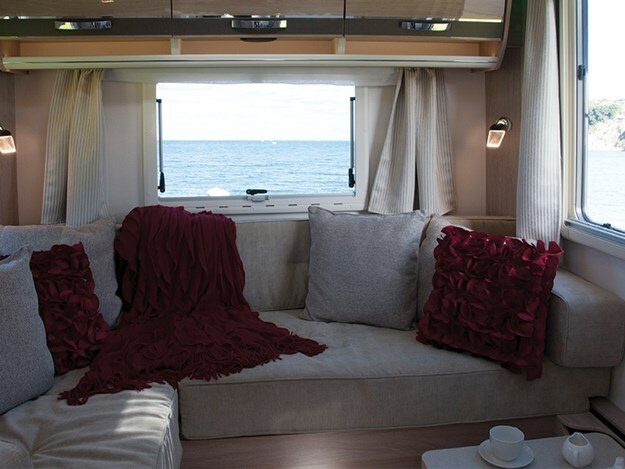 In the motorhome we reviewed, the owner has a choice of master bed: fold-down over the cab or a bed made up by re-arranging the rear lounge seat cushions. 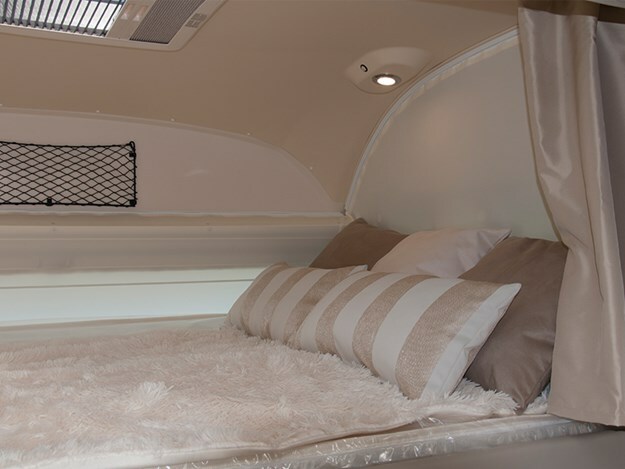 The 8094dF can also be ordered from the factory with a ‘drop-down from the ceiling’ bed in the rear lounge. There are six series in Rapido’s 2018 range with 28 different models. The A-Class fully integrated 8094dF, part of the series 80dF, is next to the top of the range. The all-white seamless body looks sleek and business-like and is brought to life by the red and grey decals that define the side windows. The 8094dF is built on a Fiat base vehicle mated with an AL-KO low chassis with an extra-wide rear axle. It is fitted with Fiat’s 2.3-litre MultiJet 150hp Euro 6 rated turbo diesel engine driving the front wheels through Fiat’s six-speed AMT auto gearbox. 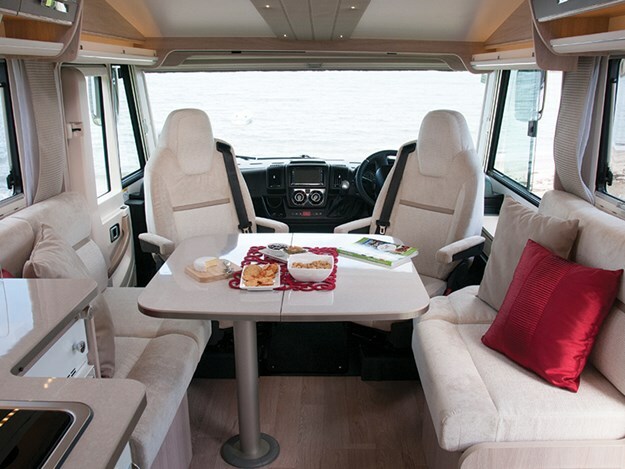 The cab fit-out reflects the Fiat drivetrain base, and all the usual complimentary comments about how easy Fiat motorhomes are to drive applies. So if you decide the Rapido ticks all your boxes, a test drive should dispel any fears about driving this bulkier-than-average vehicle. Having a lot of glass in the cab is great for visibility but not so good once the sun gets lower in the sky or when a bit of privacy is needed. Rapido comes to the rescue with pleated blinds on both, the windscreen and the side windows, as well as manual roller blinds on the underside of the cab bed in place of the regular sun visors. Rapido has opted for polyester cladding for roof, walls, and underfloor panels rather than aluminium, citing better insulating qualities, impact resistance, and ease of repair if things do go wrong. Foam sandwich construction with a core of Styrofoam HD insulation and polyurethane replacing wood is used throughout. 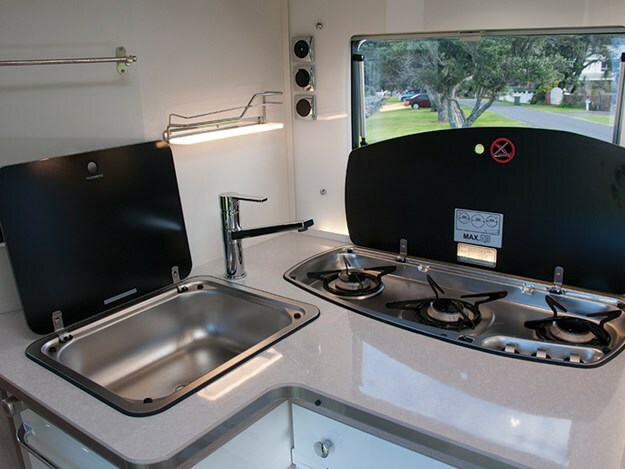 All units are tested for leaks prior to leaving the factory and Rapido offers a five-year water tightness warranty with every motorhome sold. Using the low AL-KO chassis allows Rapido to build a double floor that provides extra storage options, and a heated, frost-free space to run cabling, plumbing, and to mount equipment such as pumps, fresh water tanks, and batteries. And best of all, it results in a flat floor from front to back. It sparkles. The cabinetry finish is Castello—a pale timber patterned veneer—and the drawer fronts are gloss ivory. Overhead, the lockers match the cabinetry veneer but have a high gloss finish with a darker stripe and silver highlights across the bottom. The overall effect is light, bright, and sparkling. Accessories and highlights, faux side drapes, and the cab ceiling all hint at understated luxury. Thoughtful touches include a kitchen roll holder and a backlit shelf for spice jars, the TV above the fridge freezer that hides behind a sliding door when not needed, and the Rapido emblem coat hooks by the entry door. The standard cushion colour scheme on the review vehicle is Montana and there are half a dozen other options available for a fee. A darker cabinetry option, ‘Elegance’ is also available. Replacing the L-shaped dinette settee with a straight one makes a lot of sense. The lounge is bigger and more accessible with twin two-seater settees facing each other across the dining table. By hinging the table-top fore and aft so it can fold onto itself, access through to the cab is improved. With the table unfolded and the cab seats included, there is seating for six around the table. The seat cushions are firm, the back cushions have just the right amount of rake so that both dining and relaxing in the lounge is an enjoyable experience. When needed, each settee can be converted into a forward-facing, seat belted travel seat. I’m picking most owners will use the bed above the cab (1910 x 1400mm). It is easily lowered and raised. First the backs of the cab seats need to be folded forwards, then the restraining belt unclipped so the bed can be pulled down. Reversing the procedure puts the bed away, but it can be left made up. The privacy curtains over the windows are lowered and raised with the bed, and a pair of drapes closes it off from the lounge. The kitchen is compact, functional, and pleasing to the eye. A stylish acrylic splashback that surrounds the window behind the hobs, the kitchen roll holder and shelf beside the sink, the shiny smart lockers above the sink, and the ivory drawer fronts below all combine to create this effect. Each set of drawers is centrally locked to keep the drawers secure while the vehicle is in motion. Below the bench is a compact oven and alongside are a trio of drawers: small, medium, and large, plus one for cutlery. Down the side of the cabinet are two small shelves and a holder for a single bottle of the cook’s sherry. Opposite, by the entry, is a Dometic 160-litre two-door fridge freezer. Altogether, there is not a lot of storage, so there is every chance keen cooks will use the three overhead lockers above the lounge to house supermarket shopping. This bathroom is a two-piece affair with the toilet/vanity compartment kerbside and the shower stall opposite. Closing the twin sliding doors on the rear lounge side and swinging the toilet door through 90 degrees to close off the kitchen creates a small en suite. The odd-shaped shower has sufficient shelves for soap and shampoo and enough room for it’s main purpose—having a shower. An acrylic bi-fold door keeps the rest of the en suite dry from shower overspray. Opposite, on the bathroom side, there is plenty of room for pampering products and personal effects. Above the vanity, there’s a medicine cabinet with a mirror door and a host of long and short shelves alongside. Below is another cupboard with more shelves. A water-efficient oval basin is tucked away in the corner, and just a step back is the Thetford swivel bowl toilet. It is a practical, neatly arranged bathroom. The rear lounge provides a quality space for entertaining or just chilling out. The settee is long enough to snooze on or to read a book or watch the TV mounted in the corner cabinet. A neat freestanding coffee table also serves as part of the bed base when the settee is converted into a double bed. Opposite the settee is an extra large window so you can enjoy the view. All in all, the rear lounge offers an innovative option for buyers seeking a quiet space to get away from it all. At this time of the year, keeping warm is front of mind. The 8094dF is fitted with the Truma Combi 6 heater with the CP Plus control panel and Truma iNet function, allowing smartphone control of the heater. Also fitted is a Truma windscreen heating duct that, in conjunction with the thermal dual pleat windscreen blind, helps reduce condensation and heat loss through the windscreen when the vehicle is parked up. Heat is also supplied to the wastewater tank, so it doesn’t freeze at low temperatures. The double-glazed windows too play their part in conserving heat. 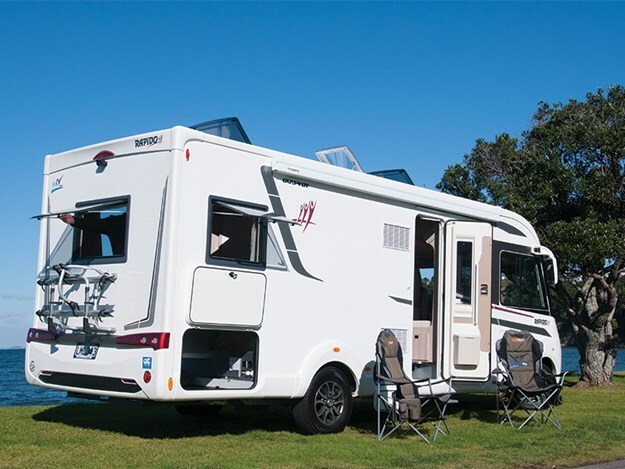 The 8094dF comes certified self-contained and is equipped for freedom camping with two six-volt 200amp/hour AGM batteries, 280 watts of solar power, fresh (130+20 litres) and grey (110 litres) water tanks and two 9kg LPG bottles. 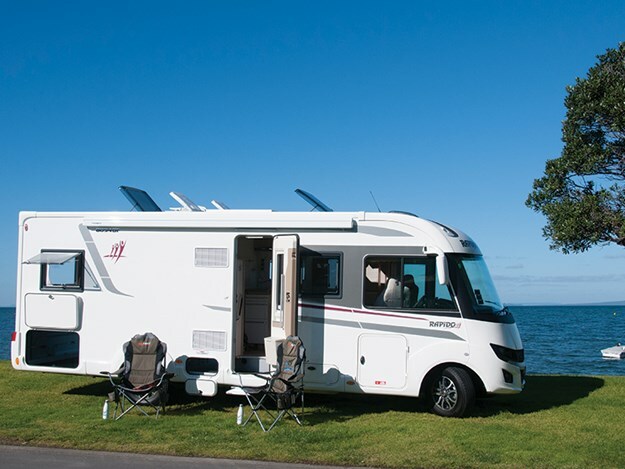 The Rapido 8094dF is a well-crafted motorhome with a touch of French flair. The manufacturer offers an extensive range of options. If what you see is not entirely in keeping with your taste, it is worth enquiring how and what changes can be made. You never know, your perfect motorhome could be just around the corner. The rear lounge in place of a main bedroom. A change in perspective in respect of space utilisation priorities. 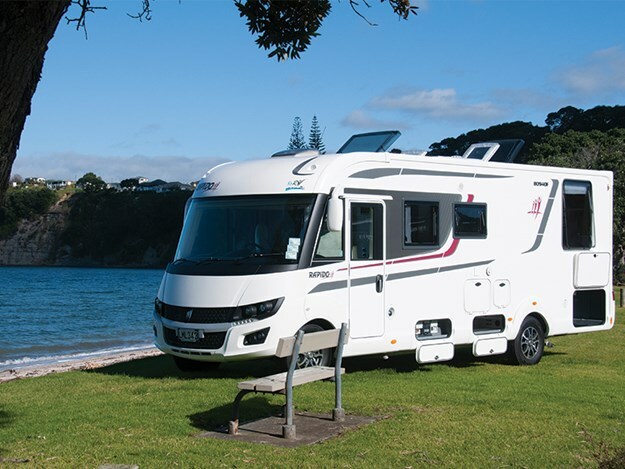 For more details, call Paul Cook and his sales team on 09 426 7679 or visit RnRv.co.nz.